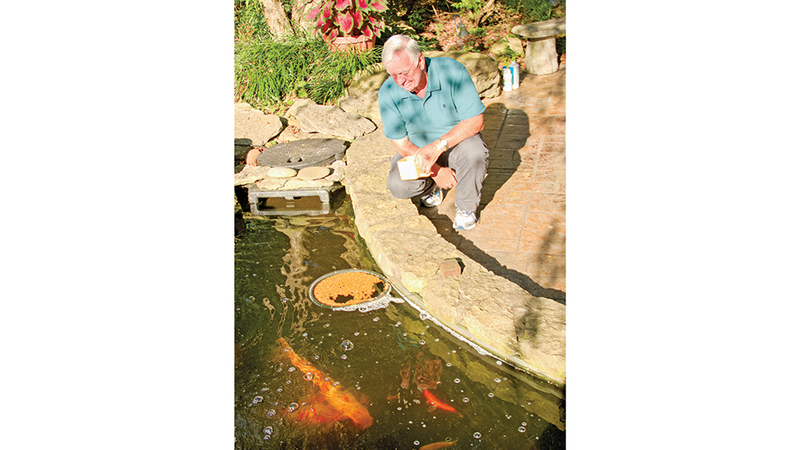 Every day, Jim Yates heads out his back door to a koi pond to feed his fish. As he nears the edge, a bright orange flash breaks the smooth, dark surface of the water. Ripples scatter across the pond as the koi signal their excitement. Jim carefully sprinkles in the food. Orbs of silver break through to the surface. Surrounded by his colorful friends, a waterfall and a lush garden, it’s a soothing ritual for Jim to come here — an unspoken reminder to soak up the serenity of this place. The setting hasn’t always been so peaceful. Just three years ago, a different home cast a shadow across this pond. It was the first home the Jim and his wife, Mary Ellen, had built, and it was the embodiment of their life-long dream. Constructed on the property where Jim was raised, no detail had been overlooked, down to the incorporation of stones from the fireplace of a nearby century-old house Jim’s great-great-grandfather had helped build. For nearly 25 years, that house was everything the couple had ever hoped for. But one phone call changed everything. The couple reached out to Zoltan Obrusanszki, the local Jim Barna Log & Timber Homes representative. Together, they worked out a plan to tear the house down to the foundation to verify that it could support a new residence. 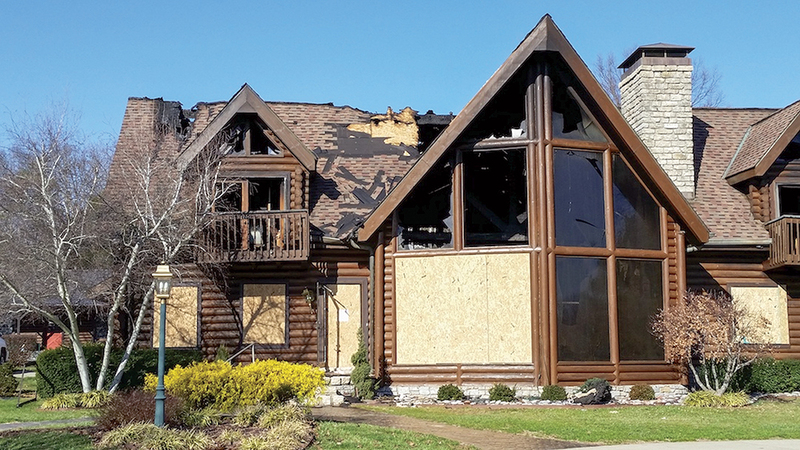 While awaiting the report, the couple began looking into other possible designs, but when the foundation cleared inspection, they knew rebuilding the same plan was meant to be. Sadly, tragedy struck again. The day after the insurance company finalized the claim on the original house, Jim fell off of a ladder, suffering a fractured skull. “I was in the hospital five times in 2016 and in surgery twice,” Jim says. 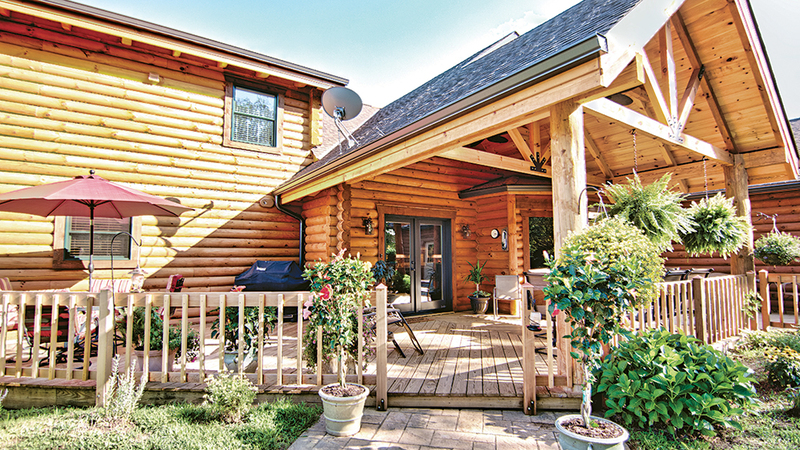 During his recovery, Mary Ellen took the rebuilding reigns, working closely with Zoltan and builder Donnie Daugherty. “We finally had a light at the end of the tunnel,” she says. Nearly 18 months after the fire, move-in day arrived. “There were a lot of emotions,” says Mary Ellen. 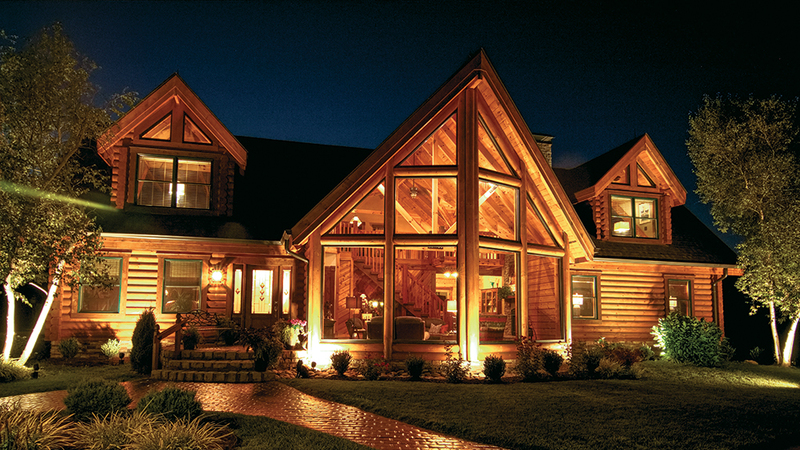 Today, the two-story design offers 4,000 square feet of easy-flowing living spaces and eye-catching architecture, including a glass prow front, vaulted ceilings and 9-inch, eastern white pine D-shaped logs with saddle-notched corners. 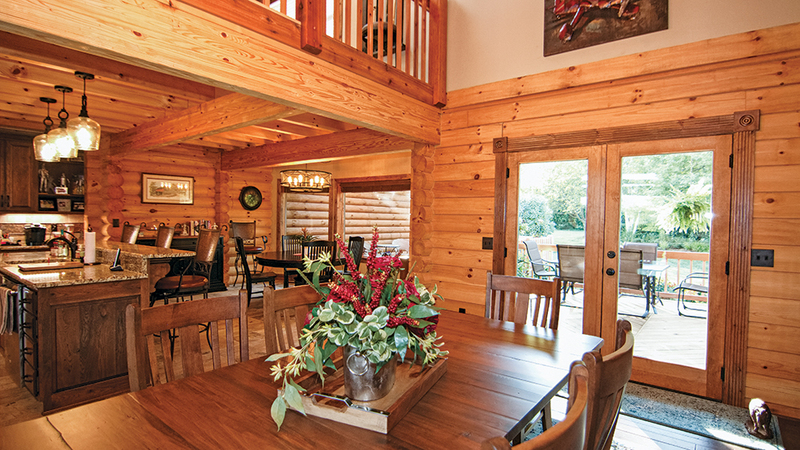 “The larger log sizes feel more impressive and fit the scale of the home,” explains Zoltan. 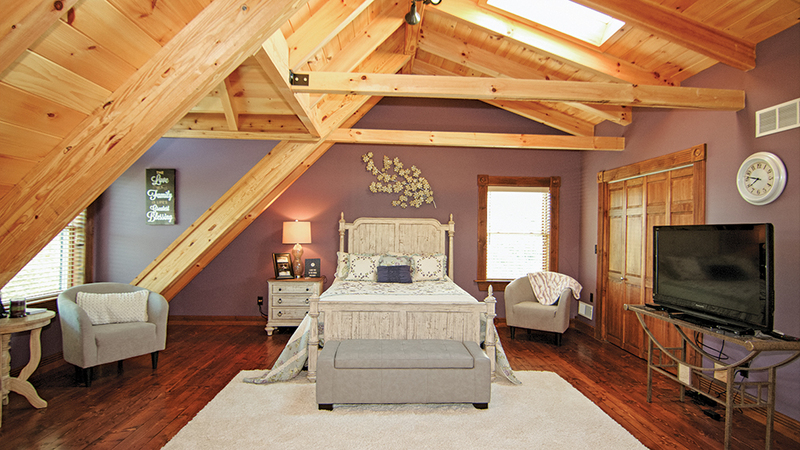 While Jim and Mary Ellen kept the original three-bedroom, 2.5-bathroom design with an open loft upstairs, they did make a few adjustments, including switching the former L-shaped kitchen to a galley “to create a better flow,” says Mary Ellen. In the process, they expanded the foyer and nixed the den in favor of a home office. A glass prow front, punctuated by a pair of gabled dormers, adds depth to the exterior and affords spectacular panoramic views. Jim and Mary Ellen enjoy caring for the home’s 10 acres, including the backyard koi pond. The couple loves being outdoors. 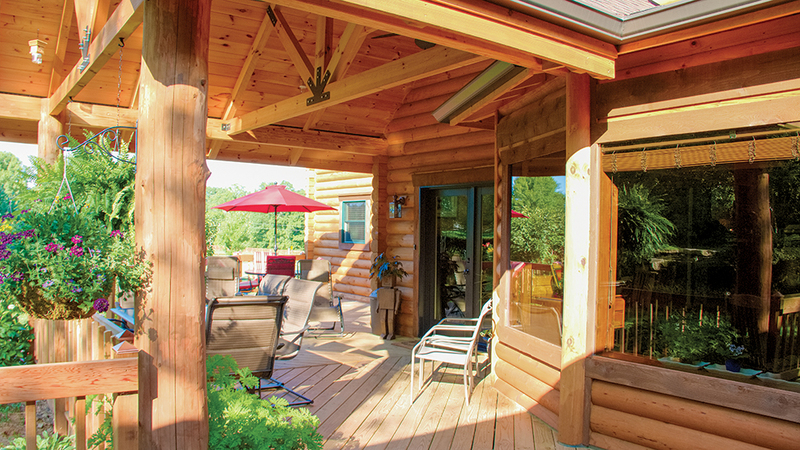 Their expansive, partially covered deck gives them plenty of space to lounge. 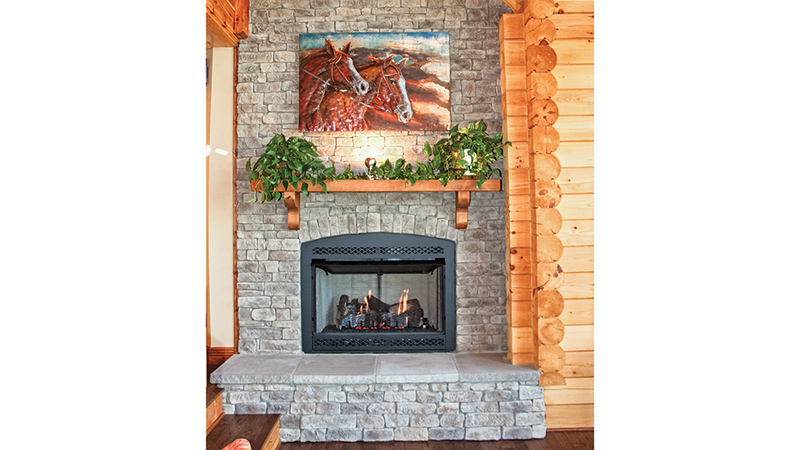 Saddle-notched corner detail adds additional flair to the great room’s two-story stone fireplace. 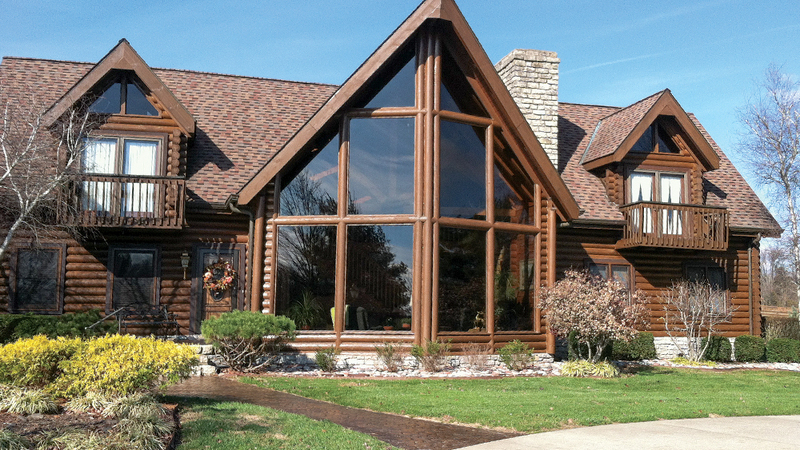 For 25 years, Jim and Mary Ellen’s home stood proud. Then a devastating fire in December 2015 changed everything. 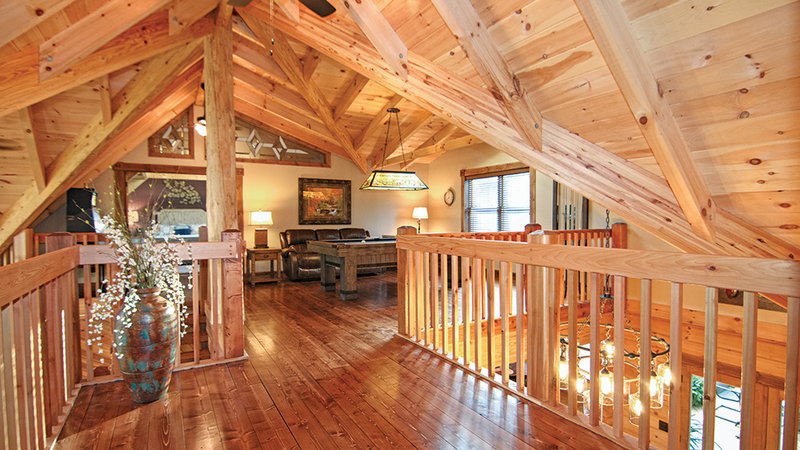 An open loft sets the tone for fun gatherings. To make the most of the space, the Yates added a comfortable leather sofa, along with a pool table, refinished antique stereo and slot machine. Soft mauve paint and white linens in one of two upstairs bedrooms makes for a tranquil respite for a family that’s faced such tragedy. 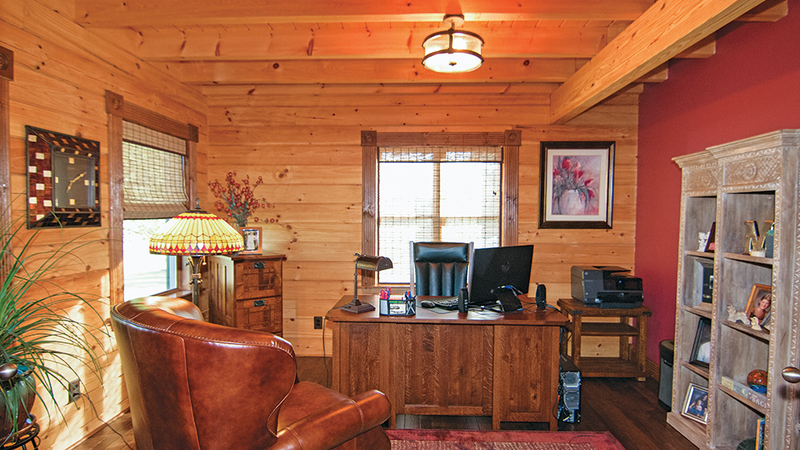 A cozy home office off of the kitchen helps the Yates’ balance their home and work lives with ease. In the restoration, Mary Ellen updated the kitchen’s design to improve functionality, including adding a terraced island to create separate prep and eating areas. 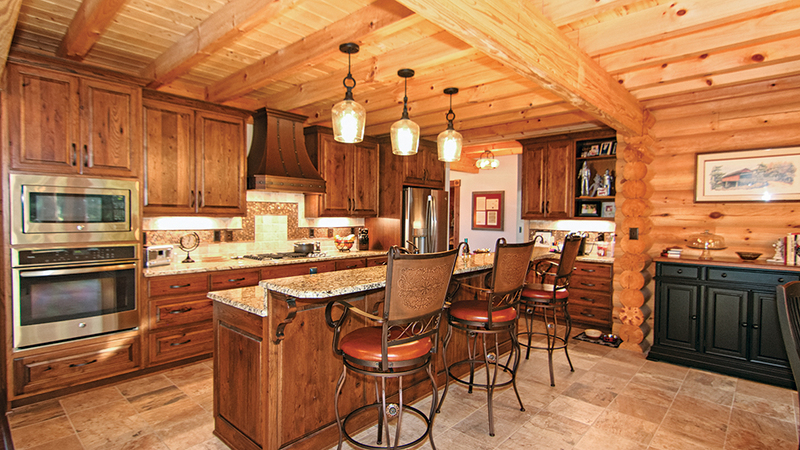 Knotty hickory cabinets, glass pendant lights and a copper vent hood add warmth and richness to the space. A loft above the kitchen creates a cozy feel below, while the dining area remains vaulted to add a sense of elegance. Adjacent French doors offer easy access for outdoor dining. The gabled porch, a last-minute addition to the restored home’s design, is the couple’s favorite spot to relax.